When having dinner with a friend last night, I was inspired to pull out the old Crockpot and make something healthy and easy. I decided that a dish somewhere between a one-course meal and a soup would be the answer. Of course, you might want to add a salad to get some greens in. The great thing about this dish is that it also works fantastically for breakfast. Now I realize most people don’t even think of soup for breakfast but, as I have found out in my Asian travels, soup is often not only a daily breakfast but an incredibly satisfying one. So double the recipe or save some for a cold morning! Place olive oil in medium size sauté pan over medium/high heat. Sprinkle all chicken with salt and pepper. Place in pan, skin side down. Cook until chicken is slightly browned. Turn and do the same. Remove. Take out all but 1 ½ T oil from pan. Add onions, garlic, bell peppers, and chili’s. Sauté until onion starts to become translucent, approximately 3 minutes. Meanwhile place carrots, tomatoes with juice, mushrooms, ginger, broth, salt and pepper in Crockpot. Place chicken on top followed by sautéed vegetables. Cook for 7 hours. About hour 6 or just before serving, remove the skin and bones from the chicken. Shred the chicken and return to the pot. Adjust seasonings and add wine around hour 6. I prefer Muir Glen brand. 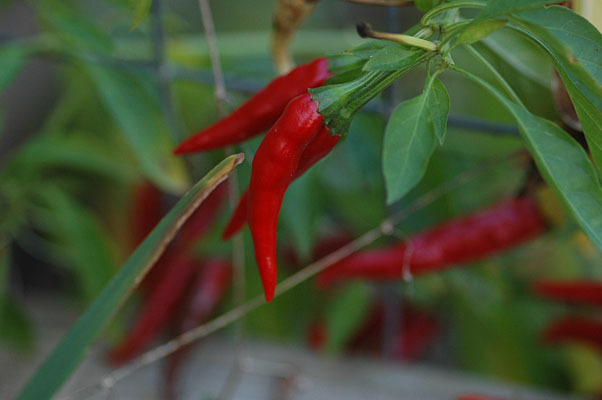 February Cooking Tip – Pass the Chili’s Please!